I've been working on a framework for a modpack that allows for customization during gameplay, rather than having to restart the game and change mod files in a list etc etc. I picked a few tweaks as test for the framework, which is now stable and opens the door for inclusion of new modifications on the fly. Most of the graphics I've used are just rehashes of the default style sheet, since the base game is broken when reading and resizing custom icon sheets and no one has yet figured out a fix for it. The mod, when loaded, doesn't do anything to the gameplay by default. However, it adds a tab to the interface which has toggle buttons for options, similar to the default settings page, which options then enact changes and unlock new technologies, traits, modes, etc, within the game. The first version for public release has just a few mod components, the addition of a log burning mode to firekeepers, and the addition of cremation technology which (coincidentally) also adds a mode to firekeepers for cremating bodies, but with several other requirements and a steeper price tag. The cremation may itself be a little unbalancing, but it's in there as a proof of concept for how the mod settings can be turned on and off within the game. I also added a toggle for the built-in hidden option of viewing resource tiers, which displays all available technology on the resource tab and the cost and requirements to obtain all of them. Work out refund of resources and currency (such as insight) for turning off the mod setting a feature or technology that has already been purchased by the player. Update the mod setting callback functions to check, add, and remove modes etc on the fly, so that loading a new version of the mod will integrate seamlessly into an ongoing game without having to restart. I also have plans for a few overloads fixes of default game elements, such as the aforementioned problem with custom icon sheets. And lastly, of course, the mod needs more content! My hope, especially once the mid-game loading is addressed, is to be able to support content from many different contributors in one place. If you have some ideas for improvements, or have coded a standalone mode that you would like to be included, please join me on the GitHub page to contribute. So, I figured out the problem with the icon display, and included a bugfix in the mod, along with a few new display options. The updated version can be added here: heritage.js, or it will automatically update on refresh if you've loaded any previous versin of the mod. Hello! I like your mod. I am going to bring my bread-baking mod over onto this. Hope to get the pull request to you soon! Cool mod! Cremation sounds interesting, but doesn't want to show up for me. It's on the tech tree, but never showed up as an option for researching. Refresh your page and that should be fixed now, without even needing to start a new game. It seems that a typo crept back into source control that wasn't reading the custom setting properly ("enablecremation:true" instead of "enablecremation:'on'"). That's been fixed in the latest release, as well as a generalization of the settings for other mods to use. There appears to be a new bug with loading manifests from multiple mods, as I'm working on an example of a separate mod using the custom settings tab from this one, but what's there should be working for now. I left a few comments on the pull request, but didn't merge it in just yet. Take a look and let me know what you think; hopefully the intention is clear enough. I'm working on versions of the mod API that will make the integration even cleaner, too. For a better idea of what I'm going for, I added a branch to the project where I implemented a separate mod with references to hooks (my "API") in the heritage mod. I used orteil's example hot pepper mod as a foundation, with a setting to enable and disable that mod and all of its elements within the heritage menu. 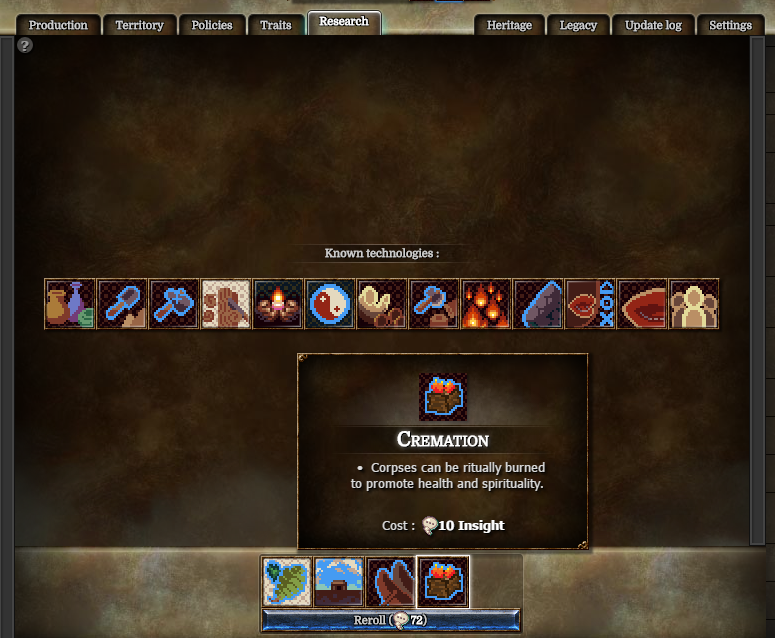 I activated the "enable cremation technology", but which kind of trait/technology is supposed to unlock this technology? When you enable cremation technology, there is a research item called cremation that will add the cremation mode to your firekeepers. In order to unlock cremation research, you must already have researched fire-making, woodcutting, pottery, and spiritualism. Hope that helps! (I think I got all the technologies since I'm building my mausoleum and I have been seeing the message "There is nothing to research" for a while). I just had a look at it, it seems really great! (Keep up the good work) I find it quite cool how NeverEnding Legacy has only been out for just over a month and people have already been creating really nice modifications (such as this one) for it)! I misspoke, the requirement is "ritualism" not "spiritualism." I just tested with a new playthrough using the version linked above and it does work. If you're updating the mod within an existing game it's possible that although I am trying to keep everything backwards compatible, there's something in your old data that's preventing it from showing up. One of the things I intend to do is a data fix on page load for situations like the "true" vs "on" typo above. Edit: I still see it, but it doesn't seem to unlock... what is wrong with my game? Looking at your save file, you still have the original version of the modpack, and for some reason the code that loads the manifest is not working properly, even though the link is correct and should have updated the URL. I'm working on a bugfix for that, but in the meantime you'll have to manually update the mod list in the settings. I'm working on a new version, and with it hopefully a fix or workaround for the manifest issue. Orteil should add public baths for upgrading health. Especially since it is hard to upgrading health. I have never been able to get it above 12 or 13%. Maybe starting by a "rule" that allows people washing themselves in water (using water), then baths (using fire and water)? Public Baths? Thats sounds like something I can add to my LegacyCOOLMod, I'll get coding that in soon.